The award-winning Silk Road Dance Company (SRDC) presents women’s dances from the Middle East, Central Asia, South Asia, China and the Caucasus. Founded by Artistic Director Dr. Laurel Victoria Gray in 1995, the ensemble’s pioneering performances offer a unique glimpse of the life, culture, and art of little known regions. Silk Road Dance Company is dedicated to the preservation, promulgation, and evolution of women’s endangered dance forms, traditions, and costumes from cultures along the Great Silk Road trade route linking China with the Mediterranean. SRDC has won deep respect from the members of the communities represented by the company’s repertoire. They have performed throughout the US and internationally in Uzbekistan, Qatar and Canada. 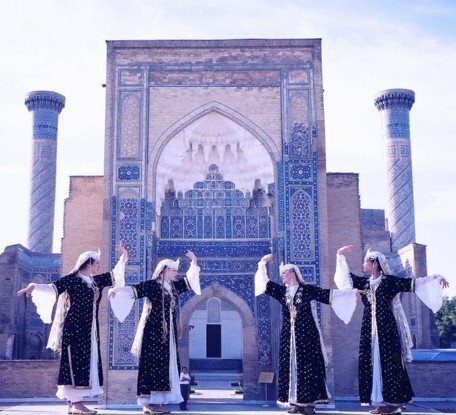 The ensemble was the subject of special broadcasts on Uzbek, Tajik and Arabic television, BBC Persian Service, the VOA, and has been featured in US magazines as well as foreign newspapers and websites. SRDC has performed for Empress Farah Pahlavi and HM Queen Rania of Jordan, in addition to appearing at events for the Embassies of Egypt, Tajikistan, Uzbekistan, Turkey, Kazakhstan and Russia. Frequently engaged by numerous cultural organizations in the local Turkish, Iranian, Arab and Central Asian communities for festivals and celebrations, their performances include Toronto’s Tirgan Iranian Festival, Seattle’s TurkFest, Miami’s Iranian Festival, Florida’s Asian Culture Festival, Raleigh’s Turkish Festival, Towson University’s Many Moons Festival, and Washington DC’s Turkish Festival. SRDC has performed nationally at Warner Bros Studios, Houston’s Museum of Fine Arts, Chicago’s Field Museum, the Philadelphia Museum of Art, San Antonio’s annual ‘Coronation of the Queen’, North Carolina State University, the Manhattan Center and the New York Metropolitan Club, Baltimore’s Walters Art Museum, the Agha Khan Foundation in Atlanta, the North Carolina Museum of Art, the Miami Iranian Festival, the Seattle TurkFest, Shepherd College and the Asia Society of New York. The ensemble has also appeared at some of the most prestigious venues and festivals in DC, including the Kennedy Center, the Harman Center for the Arts, the Smithsonian Folklife Festival, the State Department, the National Theatre, the Pope John Paul II Cultural Center, National Geographic Society, the National Press Club, the Library of Congress, Georgetown University, the Textile Museum, Lisner Auditorium, and Dance Place. Their clients include the United Nations High Commissioner for Refugees, Amnesty International, RAWA, the Mosaic Foundation, the Secret Service, the National Defense University, the World Affairs Council, the Foreign Policy Association, the National Peace Corps, the FCC, and the USDA. Ethnically diverse, the ensemble’s dancers have mastered a wide range of styles. Some rare pieces are part of the company’s ‘Legacy Repertiore’ — dances that are seldom now performed in the countries of origin. People’s Artists of Uzbekistan Qizlarhon Dusmuhamedova and Qadir Muminov have passed on a precious legacy of Central Asian dances to SRDC. Dusmukhamedova teaches a month-long residency with the ensemble each year. Other collaborators include Egyptian choreographer Momo Kadous, North African dance ethnologist Amel Tafsout, violinist Daniel Bernard Roumain, People’s Artist of Azerbaijan Yusif Gasimov, Turkic dance specialist Mujgan Ergil, Chinese dance expert Ling Tang, and Iranian choreographer Leili Tajadod. Recognized for the beauty, authenticity, and imagination of its productions, SRDC has enchanted audiences with productions like Remembering the Legends; 3,000 Years of Women of the Silk Road, The Lion and the Sun: Dances of the Old Persian Empire, Haft Paykar: Seven Beauties, Crossing Cultures: An Evening on the Silk Road, and Gul Bahaar: A Celebration of Uzbek, Indian, and Persian Dance; Legends of the Silk Road; Raqiset Shaabia: Folkloric Dances of the Arab World; Hooray for Bollywood and the ensemble’s 15th anniversary celebration, Spirit of the Silk Road. Through concerts, lecture-demonstrations, and master classes, Silk Road Dance Company promotes knowledge and appreciation of traditional dance forms of Eastern cultures by educating, entertaining, and engaging the general public. SRDC builds bridges of understanding between East and West by nourishing traditional dance forms, encouraging cross-cultural dialogue, and collaborating with other World Dance artists.